Ok, we've dug into the new Breyers BLASTS line up and if they are all as fun as this first one, this is going to be a good year for ice cream. Let me also say that I know some of you wanted me to go with the S'mores first, but we decided to crack open the Cookie Dough first on Friday night. So here is the first BLASTS! on the blog. Mrs. Fields Chocolate Chunk Cookie Dough which is Mrs. Fields Chocolate Chip Cookie Dough Pieces and Chocolatey Chunks in Cookie Dough flavored frozen dairy dessert. Note that this is not all natural like their standard flavors. I'd like to point out in particular that Breyers has pulled a Turkey Hill by flavoring the base, in this case it's with cookie dough rather than standard vanilla. This is not a bad thing by any means and actually has me kind of hopeful. Interesting! The cookie dough bits are surprisingly small, but there are plenty of them. The chocolatey chips also seem to be a good size and scattered throughout. The base looks fairly standard. All signs are pointing positive. Now lucky for Breyers, I've already sampled this twice. On my first scoop Friday night, the ice cream was still immensely soft even though it had been in the freezer two hours. Let me reiterate that it was maybe 20 minutes max that this container traveled from the second it left the freezer aisle to the moment it hit my freezer. These frozen dairy dessert at their mere 61 gram weight per serving just don't have the fat content to hold it together. My wife and I both had some and thought it was decent, though not as rewarding as a premium ice cream. This stuff was literally soupy and just wasn't that impressive at first. Things went much better as we scooped two more bowls Saturday night and settled down for some TV. 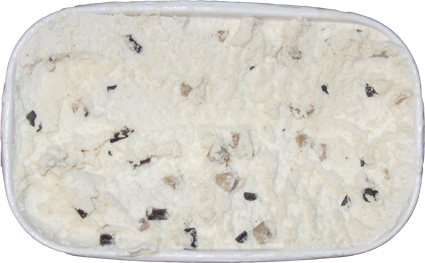 The ice cream had refrozen and we were treated to scoop after scoop of cookie dough bits in a nice flavored base. Breyers has somehow nailed the size of the cookie dough bits so they are big enough to be noticed but not so big that you only get one even 2-3-4 bites. You are getting by so many of them you literally lose count of how many you get per scoop. It may have been one, it may have been three, but all I know is that I was tasting cookie dough goodness on every scoop. See, they aren't very big are they? Guess what though? I ate these three tiny bits and they packed a huge cookie dough taste. It's like eating right from a hunk of Pillsbury cookie dough. Excellent stuff! Let me put it another way. The best cookie dough flavors leave you with a cookie dough vibe on every bite. It doesn't need to be overpowering or super sweet, but it needs to be there. Friendly's light cookie dough wasn't bad, but it lacked a sufficient cookie dough kick. We do not have this problem here. I guess I should clarify that there is no cookie dough grit to the base ice cream, it's literally just cookie dough flavor that they've somehow added to the base. Lastly, there's no strange after taste which is always important. Finally thoughts? This first BLASTS really lives up to it's name as it truly is blasted with cookie dough bits. There's literally just one serving left already, but have no fear, this will be back in the freezer again! I saw this in Wal Mart yesterday while looking for S'mores and resisted buying it until I saw your review, so this must be a sign to go BACK and get it. I am going to try a different store though so I can see if they do have the S'mores as well. One thing I notice w/ cookie dough flavors is that I almost get overwhelmed when there's a "bit" in every "bite". It's almost too overpowering, but it's also good to know it's chock full of them. Oh--and what do you think makes this one diff from the Chips Ahoy? That and the cookies and cream were the only two others they had yesterday. Oh wow this looks good, and relatively healthy too..i think id prefer small little bits of cookie dough rather than just big chunks that aren't very well dispersed, i agree that its nice to have a cookie dough bit in every spoonful hehe! Just don't call it "ice cream" (Breyers doesn't). The ingredients list is a mile long, mostly chemicals and mostly unpronounceable. Having said that, I bought a tub tonight, and will be checking it out later. i must disagree with you on this one. i bought a pint size today and after the first bite decided to stop. as you said, it is NOT ice cream. This thing you called a "flavored base" was absolutely awful! i think they did end up mixing actual cookie dough in there because it tasted like sweetened milk with raw flour or something. 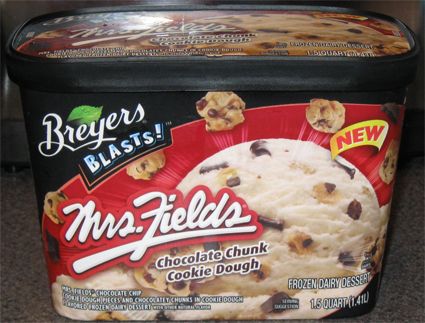 my girlfriend loves ice cream and cookie dough, and even mrs. fields but agreed with me that this was a horrible taste. compared side by side to what i picked, Ben & jerry's chunky monkey, this breyers product was miles away from it. i even checked the expiration date to see if it would explain something. well, there's no way for a frozen dairy dessert to compare to a super premium ice cream. it would be one thing to compare a light ice cream to a main stream flavor, but a BLASTS vs B&Js are on opposite sides of the composition structure. I'm not saying this one is perfect, I'm just saying it had no chance of winning. I was very disappointed to find Breyers peach ice cream is no longer ice cream but FROZEN DAIRY DESSERT!